This paper describes about the experimentation of can or plastic bottle crusher machine and analysis of mechanism used in machine. Hence in this the knowledge of analysis is necessary, and by analysis of various parts the quality and life of machine can be increased and improved. Overall, for experimentation this machine involves processes like design, fabrication, analysis and assembling of different components etc. From this the knowledge of all the parameters like design, fabrication and analysis etc. will get increase but most important the knowledge of analysis, the use of Ansys-Workbench Software is increasing day by day to determine the parameters like stress, strain, deflection etc. for safe design and long durability. MLA VISHAL N. KSHIRSAGAR, Dr.S.K.Choudhary and Prof. A.P. Ninawe. "Experimentation and Analysis of an Automatic Can/Plastic Bottle Crusher Machine." International Journal for Innovative Research in Science & Technology 1.2 (2014) : 1-5. APA VISHAL N. KSHIRSAGAR, Dr.S.K.Choudhary and Prof. A.P. Ninawe. (2014). Experimentation and Analysis of an Automatic Can/Plastic Bottle Crusher Machine. International Journal for Innovative Research in Science & Technology, 1(2), 1-5. Chicago VISHAL N. KSHIRSAGAR, Dr.S.K.Choudhary and Prof. A.P. Ninawe. "Experimentation and Analysis of an Automatic Can/Plastic Bottle Crusher Machine." International Journal for Innovative Research in Science & Technology 1, no. 2 (2014) : 1-5. Cloud computing has been envisioned as the next- generation information technology (IT) architecture for enterprises, due to its long list of unprecedented advantages in the IT history like on-demand self-service, ubiquitous network access, location independent resource pooling, rapid resource elasticity, usage-based pricing and transference of risk. The Cloud server allows user to store their data on a cloud without worrying about correctness & integrity of data. Cloud data storage has many advantages over local data storage. User can upload their data on cloud and can access those data anytime anywhere without any additional burden. The User doesnâ€™t have to worry about storage and maintenance of cloud data. But as data is stored at the remote place how users will get the confirmation about stored data. Hence Cloud data storage should have some mechanism which will specify storage correctness and integrity of data stored on a cloud. The major problem of cloud data storage is security. Thus, enabling public auditability for cloud storage is of critical importance so that users can resort to a third-party auditor (TPA) to check the integrity of outsourced data and be worry free. To securely introduce an effective TPA, the auditing process should bring in no new vulnerabilities toward user data privacy, and introduce no additional online burden to user. In this paper, we propose a secure cloud storage system supporting privacy-preserving public auditing. MLA Mr.Navanath P. Jadhav and Prof.L.Laxmi. "Public Auditing:Security in Cloud Storage." International Journal for Innovative Research in Science & Technology 1.2 (2014) : 5-8. APA Mr.Navanath P. Jadhav and Prof.L.Laxmi. (2014). Public Auditing:Security in Cloud Storage. International Journal for Innovative Research in Science & Technology, 1(2), 5-8. Chicago Mr.Navanath P. Jadhav and Prof.L.Laxmi. "Public Auditing:Security in Cloud Storage." International Journal for Innovative Research in Science & Technology 1, no. 2 (2014) : 5-8.
this paper is concerned with Control of DC motor using real time test platform based on Linux operating system, free open source simulation & control software SCILAB/SCICOS, interfacing driver code COMEDI. The Real-time Application Interface (RTAI) freeware is used to create hard real time system clock. That make Linux kernel full preemptive and deterministic. The main advantage of this type platform is that all software or codes are freely available from internet website. Using this Automation test platform Real time speed control of DC motor is done with Advantech PCI1711 DAQ card. MLA Chirag panchal and Prof. Vinod patel. "PID control of DC motor using Real-time Automation test platform in Linux environment." International Journal for Innovative Research in Science & Technology 1.2 (2014) : 9-14. APA Chirag panchal and Prof. Vinod patel. (2014). PID control of DC motor using Real-time Automation test platform in Linux environment. International Journal for Innovative Research in Science & Technology, 1(2), 9-14. Chicago Chirag panchal and Prof. Vinod patel. "PID control of DC motor using Real-time Automation test platform in Linux environment." International Journal for Innovative Research in Science & Technology 1, no. 2 (2014) : 9-14. In plant process control industries, automatic controllers are introduced. Proportional-Integral- Derivative (PID) controllers are the workhorses of many industrial controller requests. The frequently used Ziegler Nichols, most popularly called as ZN, tuning method holds good for a system with small decay ratio and fails when decay ratio is large and tuning is also difficult. Internal Model Controllertuning rules enhance the control performance by determining one tuning parameter, the filter time constant. The need for improved performance of the process has led to the development of robust and optimal controllers. In this paper, the objective ofthe controller design is to maintain the temperature of water in the liquid tank in a desired value. System identification of this temperature process is done by empirical method, which is notorious to be nonlinear and approximated to be a (First Order Plus Dead Time) FOPDT model. The advanced control system, IMC-PID and Particle Swarm Optimization (PSO) is designed for this FOPDT process model. PSO algorithm is implemented and the performance is compared with the conventional PID and IMC algorithm in terms of performances indices. It is observed that PSO for the system provides optimum values of performance indices. MLA NITHYARANI N, S.M.GIRIRAJKUMAR and K.MOHAMED HUSSAIN. "Controlling of Temperature Process using IMC-PID and PSO." International Journal for Innovative Research in Science & Technology 1.2 (2014) : 15-22. APA NITHYARANI N, S.M.GIRIRAJKUMAR and K.MOHAMED HUSSAIN. (2014). Controlling of Temperature Process using IMC-PID and PSO. 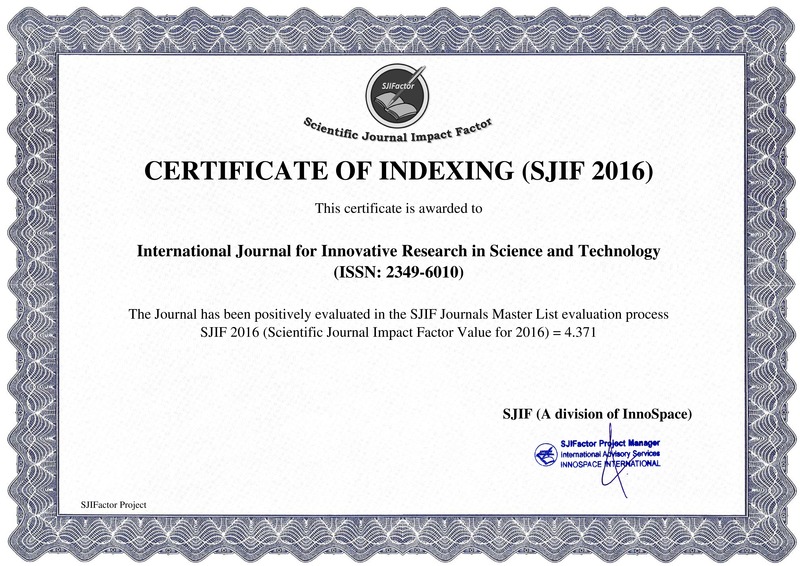 International Journal for Innovative Research in Science & Technology, 1(2), 15-22. Chicago NITHYARANI N, S.M.GIRIRAJKUMAR and K.MOHAMED HUSSAIN. "Controlling of Temperature Process using IMC-PID and PSO." International Journal for Innovative Research in Science & Technology 1, no. 2 (2014) : 15-22.